Yesterday, the White House informed Arizona Representative Raúl Grijalva that President Obama will not designate the Greater Grand Canyon Heritage National Monument before leaving office later this month, leaving more than a million acres around the Grand Canyon vulnerable to uranium mining. Grijalva introduced the Greater Grand Canyon Heritage National Monument Act in October 2015. Drafted in close collaboration with the Havasupai, Hualapai, and Hopi tribes and supported by the Navajo Nation, Zuni, Paiute, and Yavapai leaders, the proposed monument would have protected 1.7 million acres of tribal homeland around the Grand Canyon, including water sources and sacred sites, and banned new uranium mines and claims. It also would have made the current 20-year mineral withdrawal, which bans new uranium mines on a million acres around the Grand Canyon, permanent. No such luck. “The Havasupai people are on the verge of human extinction due to massive uranium development on the rims of the Grand Canyon. As the original people of this country, we are the most targeted by international mining companies who come into our territories and contaminate our waters and homes. We are very disappointed in the Obama administration for failing to protect the Grand Canyon,” said Havasupai Councilwoman Carletta Tilousi. With a presidential proclamation via the Antiquities Act (like the one President Obama used to protect Bears Ears last month) off the table for the Grand Canyon, Grijalva is reintroducing the Greater Grand Canyon Heritage National Monument Act today and making a final push for the bill in Congress. However, with the clock ticking and Arizona’s congressional delegation staunchly opposed to the monument, despite overwhelming support for the monument from voters in Arizona and nationwide, most likely, when the 115th Congress adjourns, the only thing protecting a million acres around the Grand Canyon from thousands of new uranium mining claims will be the temporary 2012 Department of Interior mineral withdrawal, which is currently under attack in the courts. This is a real setback for the Grand Canyon. 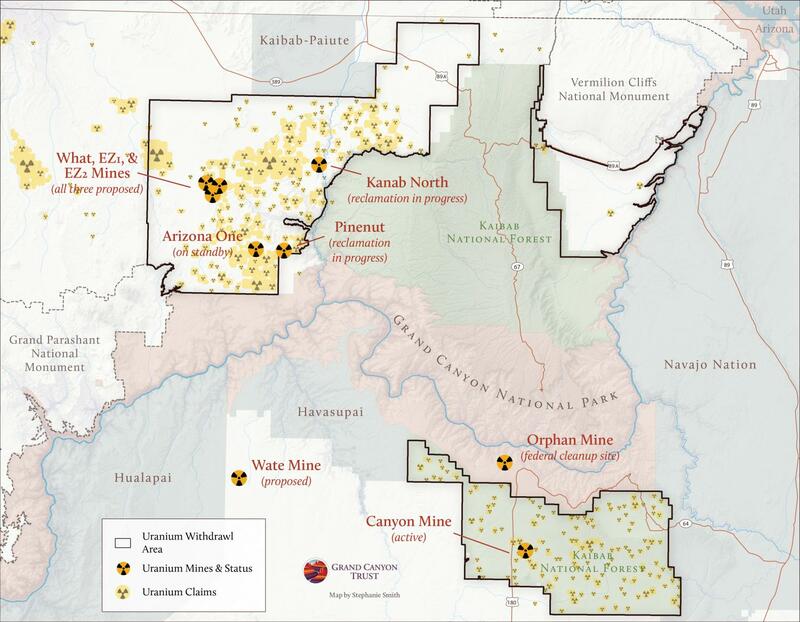 As of today, the 20-year mineral withdrawal issued by then Secretary of the Interior Ken Salazar in 2012, which currently bans new uranium mines around the Grand Canyon, is in danger, whether it be from attacks by the Trump administration, Congress, or the National Mining Association. We expect opponents of the withdrawal to come at it with everything they've got. Within months, or even weeks, the withdrawal could be revoked, opening up the Grand Canyon to more than 3,000 new uranium mining claims. This is gut-check time. To stop a rollback of protections around the Grand Canyon, the Grand Canyon Trust and partners are currently in court, defending the 20-year withdrawal from an attack by the National Mining Association and demanding that the Forest Service require mine operators to conduct a new environmental review before allowing uranium mining to resume at the Canyon Mine, near Grand Canyon National Park. Three generations of Havasupai Tribe members perform a round dance in protest at the Canyon uranium mine, near Grand Canyon National Park. On December 15, 2016, a three-judge panel of the Ninth Circuit Court of Appeals in San Francisco heard two cases that will determine the future of uranium mining within the Grand Canyon’s watersheds. It could be months before we learn the panel’s decision, plus the Trump administration or Congress may try to jettison the 20-year ban on new uranium claims that the Secretary of the Interior ordered in 2012. In National Mining Association v. Jewell, the National Mining Association (NMA) and others challenged the 20-year withdrawal of new mining claims around the Grand Canyon. Earthjustice Attorney Ted Zukoski represented the Grand Canyon Trust and others in supporting the Secretary of the Interior’s 2012 withdrawal. Zukoski argued alongside a U.S. Department of Justice attorney that the withdrawal is legal and the NMA’s suit is without merit. The withdrawal was upheld in 2014 by the district court. The NMA appealed the lower court’s decision to the Ninth Circuit. Depending on what the appellate court and the new administration decide, Grand Canyon National Park will enter its centennial-year celebration in 2019 either as a place where citizens and common sense have prevailed, or as a prize under siege by corporate interests. In Havasupai Tribe v. Provencio, the Havasupai Tribe and the Grand Canyon Trust argued against the U.S. Forest Service for allowing the Canyon uranium mine, near Grand Canyon National Park, to reopen without completing consultation with the Havasupai Tribe and without conducting a new environmental review. No matter the outcome of these looming decisions, be assured that people who are committed to protecting the Grand Canyon will remain undeterred. The Havasupai, for example, have a long history of resistance against those who threaten their sacred headwaters. Water is the Grand Canyon’s lifeblood. The Grand Canyon Trust stands with the Havasupai in defending against uranium mines and many other developments threatening Grand Canyon watersheds. Decisions made during the next few months are consequential. Together we are contributing a positive difference. The Canyon is a national treasure and should not be used in any way the will leave permanent damage either to the canyon or too the people who love her and live there. It should not be open to shopping malls hotels casinos and least of all mining! Her perfect beauty should be left unmarred in any way shape or form! Save the canyon for the future. We all need the wild places. The last place in the world that should be mined for uranium is the Grand Canyon and its surrounding area. Such activity puts the springs in the area, on which the Havasupi tibe depends, at great risk. This is unacceptable in such an arid place. Please retain the ban on uraniuum mining.